I just finished up Elizabeth: The Struggle for the Throne last night. David Starkey is an interesting writer, and in some ways he is a great entertainer. I enjoy watching his specials about Tudor history (most of them are available on YouTube, if you are interested), and I was curious about this book because it covers Elizabeth's younger years. I find the conflicts that arose out of the Tudor reign to be fascinating, and though I have read much about Henry VIII and his wives, I haven't spent much time reading about his children or what happened in the aftermath of his death. The story is filled with tension, and it is a testament to both the story and Starkey's writing that I read this book so quickly. Starkey's narrative style is great. He tells an already good story in a way that reads like a novel. Like I said, I am more familiar with Henry and his wives, but this book made me realize how long the consequences of Henry's reign (and those who ruled before him) carried into the future. 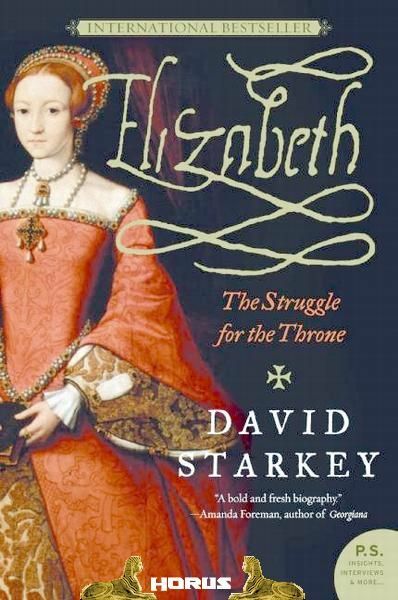 I still want to read individual books on Edward VI and Mary I, but this was a great introduction to their stories (and Elizabeth's, of course). Some reviewers have complained about Starkey's "high opinion" of himself and how he puts down other researchers. There is some of this in the book, but I didn't find it distracting; however, I am used to reading academic books built on argument, so maybe that is why it doesn't bother me so much. Starkey has spent most of his life studying the Tudors, so he does have his beliefs about what he's discovered. Some ideas seem to hold weight, while others...well, I'm not so sure. Still, it doesn't matter to me all that much. I enjoyed the book, and I would highly recommend it as an entertaining and informative read. 1. 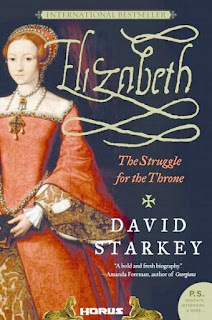 Starkey hates Elizabeth I's writing style. He says she repeats her usual structure over and over, and he sarcastically refers to this style several times. 2. He called the Dudley/Elizabeth affair "Clintonesque," and that was too funny in the context in which it was written! This comes near the end, so you will have to wait for it. My takeaway from this read? For the first time in my life, I am really happy that I am an only child.